Baked Pork Chop Recipes - A collection of Oven Baked Pork Chop Recipes. We use a boneless pork loin chop to make oven fried pork chops. Beer Lime Pork Tenderloin - Marniade your boneless pork in beer and cook on medium heat. Very delicious & different. Fried Pork Chop Recipes - A collection of fried pork chop or loin that are seasoned and breaded. Grilled Pork Chop Recipes - In our collection of simple grilled pork chops and pork loins recipes. We use a easy marniades that makes a tasty and juicy Grilled pork. Grilled Nutty Pork Broil - Yummy grilled pork with a nice light nutty favor. Simply cooked onto the grill. Oven Fried Pork Loin Chops - Delicious easy oven fried pork recipe. Great for the whole family! Pork in Mushroom Sauce - Very easy and quick. We used mushroom soup as the sauce. My whole family was asking for seconds. 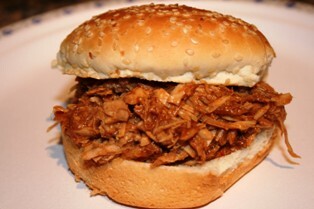 Pulled Pork Recipe - A collection of pulled pork recipes. This is a true taste of southern cooking that are moist and tender. 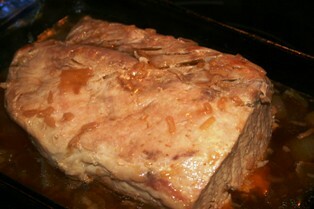 Garlic-Herb Roast Pork -Made with a nice cut of boneless pork tenderloin. 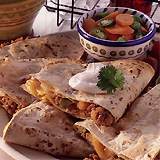 Spicy Pork Quesadillas - Is maded with Ground Pork meat seasoned with spices can make either a great appetizer or a meal. Stuffed Pork Loin Recipes - Get Stuffed with Stuffed Pork Recipes you'll want to make it time and time again. Filled with a Fruit stuffing creates a yummy main course.